The user blasts the target with a gust of repulsive wind. This may also raise all the user’s stats at once. The user stimulates its brain by thinking bad thoughts. This sharply raises the user’s Sp. Atk. The user hurls a shadowy blob at the target. This may also lower the target’s Sp. Def stat. This move prevents the target from using its held item. Its Trainer is also prevented from using items on it. The user stores power, then attacks. If the user moves after the target, this attack’s power will be doubled. The user slaps down the target’s held item, and that item can’t be used in that battle. The move does more damage if the target has a held item. An energy-draining punch. The user’s HP is restored by half the damage taken by the target. The user creates a bizarre area in which Pokémon’s Defense and Sp. Def stats are swapped for five turns. The user turns the target’s power against it. The higher the target’s Attack stat, the greater the move’s power. 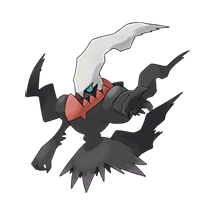 What do think about Darkrai?